Experts agree that oral health care is a key component of prenatal care. The American College of Obstetricians and Gynecologists encourages physicians to counsel women about oral health and "the safety and importance of oral health care during pregnancy." Yet many women go through pregnancy without receiving any dental services. In particular, women who are enrolled or eligible for Medicaid encounter several hurdles when seeking needed care. In the brief Oral Health during Pregnancy, the Children's Dental Health Project asserts it is time for the oral health system to prioritize women and their oral health. Research suggests gum disease may increase the risk of adverse birth outcomes. Other studies reveal that children are 3 times more likely than others to have poor oral health if their mothers have untreated tooth decay. Further evidence shows that poor oral health among struggling parents can threaten family success, including by limiting job opportunities and earnings. This hardship is exacerbated for women, who already face inequality in employment and income. This brief takes a fresh look at what is at the core of obstacles facing Medicaid-eligible pregnant women seeking dental care and offers key goals to accelerate progress. The Children’s Dental Health Project produced this report as part of a special series, Oral Health's Unanswered Questions. Briefs in this series take a new look at persistent challenges facing the oral health of children and families. 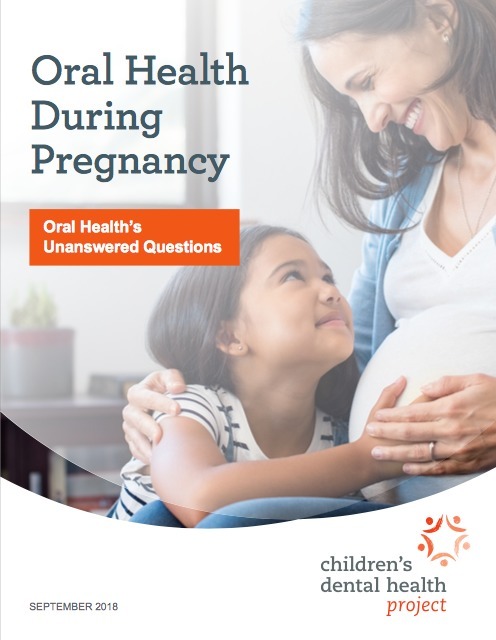 CDHP aims for Oral Health During Pregnancy and forthcoming reports in the series to spark renewed momentum for change, spurring conversation and collaboration among the full range of oral health stakeholders. Download the report and infographic by clicking the links at the top of this page. Read a blog authored by Meg Booth, CDHP executive director. Review the webinar, Prioritizing Oral Health during Pregnancy, hosted by CDHP in Nov. 2018. Listen to the recording and download slides. See additional material from presenters under the 'webinar' section at www.cdhp.org/toolkit. Download an infographic designed by CDHP and the American Academy of Pediatrics to educate families about the safety and importance of dental care in pregnacy. Available in English, Spanish and Chinese.